Finally! As of October 7th, each of the 12 District looks has been revealed and they are amazing! October 1st brought up the official launch of CoverGirl’s Capitol Collection, and having seen it, you have got to try out a few (or more) products from the line. Also released on 10.1.13, were two additional looks from the Districts. Fans had but a moment to catch their breath before CoverGirl released three more District looks! On Monday, October 7th, the two remaining Districts will have their looks revealed. The Makeup Examiner’s beauty column! "The precious mineral coal translates to stormy eyes. Our districts make countless contributions to society and we in the Capitol are forever grateful to them. To celebrate the spirit and tireless efforts of our districts, we asked COVERGIRL to translate the various industries into captivating looks. Our first glimpse of the coming collection? An avant-garde take on District 12, which mines the coal that powers the many workings of Panem. To capture the dark, foreboding work of this district, COVERGIRL Capitol Makeup Artist Dotti created an eye palette of shades reminiscent of the iridescent natural resource. 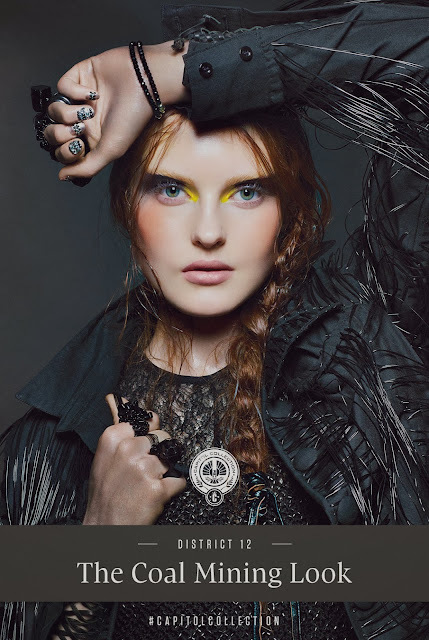 “I was inspired by the interpretation of coal mining, by the colors in coal mining: the dust, the grey, the silvers and the black,” she says of the collusion of strong colors that enhance our District 12 model’s blue-grey eyes. Of the bright, bold sweep of canary yellow in the inner corner of the eye, Dotti adds: “It signifies the power in coal.” The model’s monochromatic black attire and long, thick braid is a nod to District 12’s very own heroine, Katniss Everdeen," Capitol Couture.